It’s not that I don’t respect how the comic strip has been in syndication since 1970 and has entered the national consciousness. It’s not that I don’t respect how author Garry Trudeau won the first Pulitzer Prize ever for a comic strip with his most important work. It’s just that I never connected with the material. 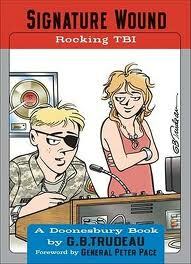 Trudeau’s “Signature Wound: Rocking TBI” is a collection of “Doonesbury” strips from 2010 that focuses on the traumatic brain injury of Sergeant First Class Leo “Toggle” DeLuca. It is the third book in the “Doonesbury” trilogy covering the war in Afghanistan and Iraq, and follows Toggle from injury to slow, painful recovery. After the injury, Toggle recuperates with the help of his former commander “BD,” his chain-smoking mother, and his budding new love interest: MIT-educated, biological engineering student Alex. The major players in “Signature Wound” are familiar – or rather, the canon of characters is familiar to regular “Doonesbury” readers, but not to the rest of us. It is this presumption of familiarity with the cast that is an off-putting aspect of this series, and this book. I am supposed to understand how politically conservative BD’s character is by his actions, but this information was only apparent after a brief internet search. In one particularly jarring sequence on page 67, an older gentleman and a younger woman discuss emails they have exchanged with Alex, and for the life of me I still have no clue who these people are. They joke about Alex living in a trailer park with a vet with TBI – what is actually happening at the time – but since we don’t know their relationship to Alex, we can’t tell if they are being sarcastic or if this is an example of Trudeau’s oft-employed, fourth-wall-breaking irony. The ultimate result is a joke whose impact is deflated, and a sequence that is wasted, or shouldn’t have been included in the first place. Portraying time in comics, let alone in comic strips, is a particularly difficult challenge. “Doonesbury’s” format is a four panel installation every week, with the last panel devoted to the strip’s punchline. The problem with “Signature Wound,” by nature of its format, is that it becomes a repetitive sequence of introduction, build sequence, and conclusion on every single page. The sensation is akin to watching multiple consecutive episodes of a television show marathon, where what might have been successful in weekly doses flounders when viewed uninterrupted. It also punctuates and disrupts whatever flow the author may have tried to achieve and distorts how many minutes/days/months may have elapsed from panel to panel. Even with time prompts, we don’t get a real sense of how long it has taken for “Toggle” to recover. This may seem more like a criticism of the “collected strips” format than “Signature Wound” itself, but other strip collections from “Calvin and Hobbes” to “University Squared: The Angry Years” have executed this format much more successfully, producing a harmonic fabric of time in which their characters can breathe. The book ends – and I mean, truly ends – as abruptly as it begins. Toggle has made steady recovery from his traumatic brain injury with the help of his new girlfriend and a serendipitously procured job. He is on the cusp of beginning college, and, with a final joke about his TBI, the narrative is over. There is no resolution, but only the very real sense that this was probably the last strip the editors could find that was related to this topic. To be sure, there are highlights to “Signature Wound,” the brightest of which is Alex. From her first lines, Alex’s warmth, intellectual curiousity, and emotional depth are immediately apparent. Her personality leaps off the page, so when she expresses trepidation about overanalyzing a situation, or when she experiences breathless joy upon receiving the label “girlfriend” for the first time, the reader is immediately alongside her. She singularly anchors the second and third act of the book. The technical details of Traumatic Brain Injury, additionally, are a triumph of delicacy and subtle humor as handled by Trudeau. Paticularly fascinating is the discussion of the management of post traumatic intracerebral pressure, while traveling in an artificially controlled cabin pressure system of a medical army plane. In Toggle’s post-operative rehabilitation, we see him struggle with the dichotomy of comprehending the speech of others while being unable to express himself, similar to other terrifying medical conditions like “Locked-In Syndome” and “Broca’s Aphasia.” Nuanced, detailed medical information like this is not an accidental revelation, but clearly reflects the exhaustive field research Trudeau has undertaken. Perhaps the book’s finest hour is the moment of trauma itself, event ground zero. In a four panel scene not unlike every other page in “Signature Wound,” a private in Toggle’s Humvee warns of a suspicious truck ahead of their own vehicle. Toggle’s passenger in the front seat is also wary of the automobile and directs Toggle to pull back. Toggle, ears damaged from years of playing music too loud, doesn’t hear. The fourth panel is bright white, wordless, and shocking in its depiction of a silent, blind blast. There is no extra dramatic pacing to the scene, and time does not stand still. It presents the series of heinous events in real time, and demonstrates a scene that likely occurred all too often during this decade long war. When discussing “Doonesbury” with its many fans over the years, a good portion explain that I wouldn’t “get” the strip because I did not grow up in the 60s. That exposition is incredibly unsatisfying to me. I wasn’t alive during the Great Depression but felt Will Eisner’s pain and desperation as a struggling artist in “The Dreamer.” I did not serve in the Vietnam War but connected with the dizzying confusion of being so distant from home in Doug Murray’s “The ‘Nam.” I’ve only read about World War II but the dulling, mundane numbness of being removed from conflict is a universal theme so well explored in Guibert’s “Alan’s War.” Similarly, I shouldn’t have to be a politically left-leaning baby boomer to appreciate “Doonesbury’s” universally lauded gifts. With “Signature Wound’s” successes and shortcomings, where does that leave the book overall? I would say dead even, and I could make a recommendation for or against this book in equal measure. It does not work well as a standalone piece. But it has absolutely piqued my curiosity to read the first two books of the trilogy to aid me in tapping into “Doonesbury’s” greatness. But for now, “Doonesbury” still remains an exclusive club, a circle of friends telling inside jokes at a party. And I hope that someday I can be let in on the joke.